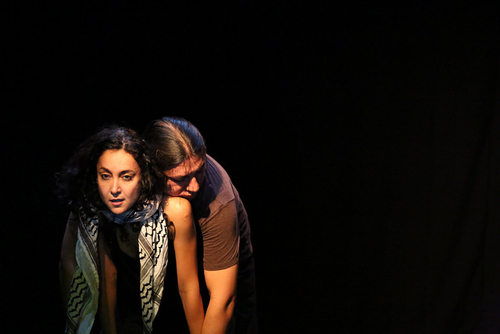 Return Home, playing as part of this year’s SummerWorks Festival, is a story of two women — one an Indigenous Anshinaabe woman from Quebec (played by Emilie Monnet) and the other an Indigenous Palestinian woman born in exile (Dima Alansari). Their lives and histories become intertwined with the help of Raven (Carlos Rivera), an Indigenous Mixteco from Mexico whose spirit-like presence weaves through both women’s lives. This is a story of what each woman can learn from the other other told in vignettes, movement, projections, sound and music. There’s a lot to absorb in this 75-minute piece playing at The Theatre Centre, and aside from a few bumps along the way, it’s an intriguing ride. The two women meet at a rally where first their differences place the two at odds but slowly, after a series of meetings on the bus, they begin to share their stories. The character of Raven is ever present in the background. Through sharing of poetry, stories of their grandparents, and the common desire to feel safe and free in their own homes, the women form an unlikely friendship. I found the stories of both these women incredibly intriguing. I was captivated and wanted to learn more. I found myself caught in the moment as one was telling a tale only to be taken away when a movement piece started up. There were times when I found the movement segments to be excessive, bordering on silly and comical rather than something that added depth to the story at hand. This left my attention wavering in and out at times. The photos and other projections paired with the live music was great to watch. I loved the music used throughout, in particular the integration of traditional Palestinian and Ashinaabe songs. I found myself drawn to Monnet’s performance and found her character nuanced and rounded. When she took up her drum and chanted, I was astounded by her voice, it’s incredible. On the other hand, I found Alansari’s delivery landed on a singular note: sharp and pointed, even when her lines were more introspective. The Theatre Centre has great acoustics so she can be heard even if she were to speak softly. But my quibbles aside, Return Home is a fascinating journey to take and one certainly worth following along with during your SummerWorks excursions this year. Return Home plays at the Theatre Centre Mainspace, 1115 Queen St W.
Individual SummerWorks tickets are $15 at the door (cash only). Live Art Series tickets are free – $20. Tickets are available online, by phone at 888-328-8384, Monday – Friday 8:30am-5pm, in person at the SummerWorks Info Booth – located at SummerWorks Central Box Office – located at Factory Theatre (125 Bathurst Street). Open August 4-16 from 10am-7pm (Advance tickets are $15 + service fee).